Kids can sometimes be careless when it comes to personal hygiene. 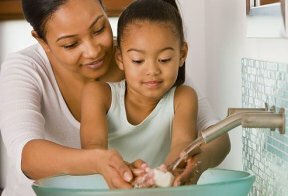 The Centers for Disease Control and Prevention (CDC) note the importance of good hygiene, especially during cold and flu season, when sickness can be passed around because of unwashed hands and uncovered coughs. Therefore, good hygiene should be taught at school and at home. Make personal hygiene interesting by playing games that will help hit home the importance of hygiene. Whether in the classroom or at home, kids can learn about hygiene’s importance and find the right ways to stay neat, clean and healthy. You can play a matching game that teaches kids the various tools for personal hygiene and which body part to use them on by creating a matching game. On one set of cards, draw pictures of soap, a toothbrush, fingernail clippers or mouthwash. Then create another set of cards that shoes hands, teeth, nails and mouth. Flip all of the cards over and have the children try to match the tool to the body part.